منذ الاعلان عنها في يونيو حزيران ان في برل Hellersdorf مأوى للطوارئ للالهارب ينبغي أن تنشأ، أصبحت منطقة مثال معروفة من تعبئة عنصرية ضد الهارب. وأعرب عن تقديره على نطاق واسع التحريض على مبادرة المواطنين العنصري من قبل السكان المحليين. نظمت نظمت النازيين الجدد العديد من المسيرات والحملات الدعائية. العديد من السكان التي أنشأتها تعليقات عنصرية وحتى تحيات هتلر المناخ الذي النازيين يمكن أن يشعر. لكن البقعة نفسها كما يظهر احتجاج ضد هذه المشاعر العنصرية. أعطى العديد من الناس احتجوا على المسيرات النازية والتبرعات وتقديم الدعم المتنوعة. ل3 اكتوبر، فإننا ندعو إلى مظاهرة مناهضة للعنصرية يحظى بتأييد واسع في قرية هيلر لإظهار التضامن مع الهاربين. وتبين لنا معا أن برلين ليست مكانا للعنصرية! Since it became publicly known in June that in Berlin- Hellersdorf an emergency shelter for refugees should be erected, the neighborhood has become a well-known example for the racist mobilisation against refugees. The incitement of a racist citizens‘ initiative met with general approval from local residents. Organised neo-Nazis arranged numerous rallies and propaganda campaigns. With racist comments and even Hitler greetings several residents created a climate in which the Nazis can feel comfortable. But on-site protest against this racist feeling was pointed out. Many people protested against the Nazi rallies, gave donations and provided support in various ways. 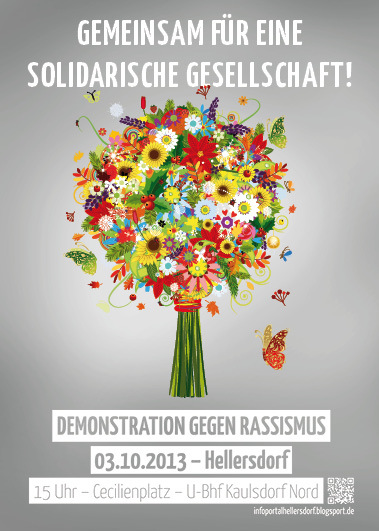 For the 3rd October, we call for a broadly supported anti-racist demonstration in Hellersdorf to show solidarity with the refugees. Let’s stand together for a Berlin without racism! The present racism was publicly shown at an information event organized by local authorities on 9th July: hundreds of local residents railed against asylum seekers and their placement in „their neighbourhood“. Amid loud applause well known neo-Nazis could publicly agitate against refugees. The mobilisation was supposedly organised by the „Bürgerinitiative Marzahn-Hellersdorf“ (citizens‘ initiative Marzahn-Hellersdorf), which is connected via Facebook. They brought together racist locals and neo-Nazis under an unsuspicious name and continue trying. The reaction of the helpless district mayor afterwards reduced to blaming „left-wingers and right-wingers from outside“. The openly groundbreaking racism of locals was simply denied. Now some residents feel primarily as victims of the nationwide media attention. If district policy now demands that „a calm atmosphere should be reestablished“ it must not be forgotten that it was only because the anti-racist activists on-site spoke out against the neo-Nazis. If also the commissioner of the Berlin police, Klaus Kandt, sees alleged confrontations between „left-wingers“ and „right-wingers“ as the biggest problem, then this belittles the common racist climate, almost daily racist actions around the shelter and attacks on several refugees. The ugly face of racism in Hellersdorf showed itself to the broad public and provoked outrage. Unfortunately, it is a matter of fact that racism is part of the everyday life of refugees and those who are perceived as different from the so-called German mainstream society: it manifests itself in the form of discrimination in education and apprenticeship, in job-seeking or in random police checks at train stations just because of the appearance. Another fact is the forced, inhumane housing situation of refugees in camps and so-called emergency shelters. For a long time facilities as in Hellesdorf have been sad practice in Germany and are legitimised through a series of racist special laws. Those laws regulate accommodation, restrict the freedom of movement of refugees and forbid them to get a job. It becomes clear that exclusion, hopelessness and a life on the poverty line are calculated and politically motivated. This legally legitimized unequal treatment was passed by a particularly broad coalition of CDU, FDP and SPD after racist pogroms in Germany in 1993. It caused the de facto abolition of asylum law and is still being defended nowadays by acting ministers of the interior. This anti-asylum policy became the prototype of the European immurement against refugees: fugitives, who arrived through supposedly „safe third countries“ will be deported, thus making all surrounding EU countries part of the German regime barrier. The militarized border protection agency FRONTEX forces refugees to get to Europe on dangerous routes every day. Who reaches Europe is subjected to a control and deportation system and usually assigned to the country of entry, where the accommodation, often in overcrowded camps, social deprivation and exclusion from social life are the norm. As Germany celebrates itself for a successful crisis management, integration and economic growth on 3rd Ocotober („Tag der Deutschen Einheit“ – Day of German Unity), we want to oppose this self-assurance. The national rapture between sport events and supposedly good economic data hides that murders and attacks with racist and nationalistic background are commonplace in this country. The mood in Germany is currently far from being solidary with people who have fled from war, political persecution and who came here for a better life. Thus the slogan „Refugees Welcome“ for us especially stands for a claim and request to all. Instead of mutual competition we want to put a culture of solidarity, instead of setting a climate of exclusion a welcoming culture. In concrete terms this means to support the claims and self-organized protests of refugees, for example the Berlin Refugee Protest camp at Oranienplatz. There, down to the present day, many of the refugees, who left their allocated camps last year and brought their protest on a march to berlin, live and organise their resistance. By now, the refugees in Hellersdorf face much solidarity through donations or people who offer language courses and other support. On 3rd October let us show together that racism has no place here and we together stand up for a solidary society and a true right to asylum – without discrimination and racist special laws. United for a solidary society – against racism! Du browst gerade in den Antirassistisches Infoportal Hellersdorf Weblog-Archiven nach der Kategorie 'Demonstration'.